Sri Bhagavan VaShi Baba and Sri Mirabai Ishwari, husband and wife, have dedicated their lives to spiritual practice for the benefit of all beings. The Yogis of Sat Manav are all initiated disciples of our Gurus, and live here solely to receive our Gurus’ practice emanations and spiritual guidance, and to live the teachings of Sat Manav Yoga. Sri Bhagavan VaShi Baba lives in semi-retreat, engaged in full-time Yogic practice to attain the Divya Deha or Divine Body—the ultimate potential of a human being—and continuously emanates Satchitananda (fulfillment) to all beings. Even as a young boy growing up in the US, Bhagavan diligently sought the truth. Seeing the immense suffering in the world and finding no apparent answer to it, he plumbed the depths of countless faiths and religions. He became a highly skilled martial artist and an accomplished natural healer. Through his intense study, he found the teachings of Sri Ramana Maharishi, one of the greatest sages of the 21st century. Sri Bhagavan studied at ashrams devoted to Sri Ramana in Cananda and New York. Sri Ramana’s teachings brought Bhagavan to Yoga, and he embarked on his first of many pilgrimages to India. In India, Sri Bhagavan received the darshan (teachings) and guidance of many accomplished Yogis; including, in particular, Yogi Ram Surat Kumar and his chief disciple, Perumal Swami. From Sri Siddhanath, a traveling Yogi of great age and attainment, Sri Bhagavan received Diksha (direct transmissions) regarding the Divine Body and the astonishing potential of Yogic practice to enhance and extend life. Practicing with ever-greater intensity and effect, Sri Bhagavan attained Realization of the Truth at Vashistha Gufa cave in Rishikesh, India in 1997. At the Gufa, Sri Bhagavan met Swami Shantanad, one of the foremost disciples of Sri Ramana Maharishi. Swami-ji told Sri Bhagavan (known as Bhagavan Das at the time) to “drop the Das” (servant) from his name, foretelling his Enlightenment and offering confirmation that Sri Bhagavan was no longer a servant of the Lord, but an embodiment of the Lord. Seeking now a Divine intention and practice that could literally change the world, Sri Bhagavan was led to the feet of the immortal Sri Mahayogi Bhusunda, the greatest and longest-lived of all Yogis, widely revered by Yogis and scholars alike. The practice of Sri Mahayogi Bhusunda goes beyond the experience of pure awareness, bringing into attention also the movement of Prana (life force) perceiving complete Realization beyond that of Mind alone. Through this ultimate practice, Sri Mahayogi Bhusunda has directed Sri Bhagavan and his disciples to accomplish the highest and most vitally important of all possible goals—to infinitely expand Life on Earth and reverse its impending destruction by aligning human consciousness with our True Nature through the power of collective emanation. Classical Yogic scriptures state that the Guru “appears” when the disciple is ready for the teachings of Yoga, and that through service to the Guru the disciple serves that which the Guru serves: the goal to benefit all beings. Sri Mirabai felt the suffering in the world intensely. She saw the destruction humanity inflicted upon itself and the Earth. Though she did not know what it was, she firmly believed that there was an answer and that she had to find it! Her Guru “appeared” in the summer of 1998, when Sri Mirabai first met Sri Bhagavan through his work as a healer. Applying his advice about health and happiness to her life, she saw quick and amazing results. She soon became very interested in his deeper teachings about how humanity could heal the world. Acknowledging the pure power and rationale of Sri Bhagavan's teachings, the path of Sat Manav Yoga, it was only a matter of months before Sri Mirabai quit her job and moved to the Ashram. She immersed herself in life as a Yogini, dedicating herself to benefiting all beings. She completely surrendered her ego and personal agenda. Her main goal was to spend as much time with her Guru as possible, absorbing his emanations and teachings. Sri Mirabai made a vow to “be the best disciple,” knowing that in serving the Guru, whose only intention is to benefit all beings, she would be serving and furthering that altruistic intention through her actions, words and emanations. Her one-pointed attention bore fruit very quickly and she manifested attainments in a matter of months that many committed Yogis took years of practice to achieve. 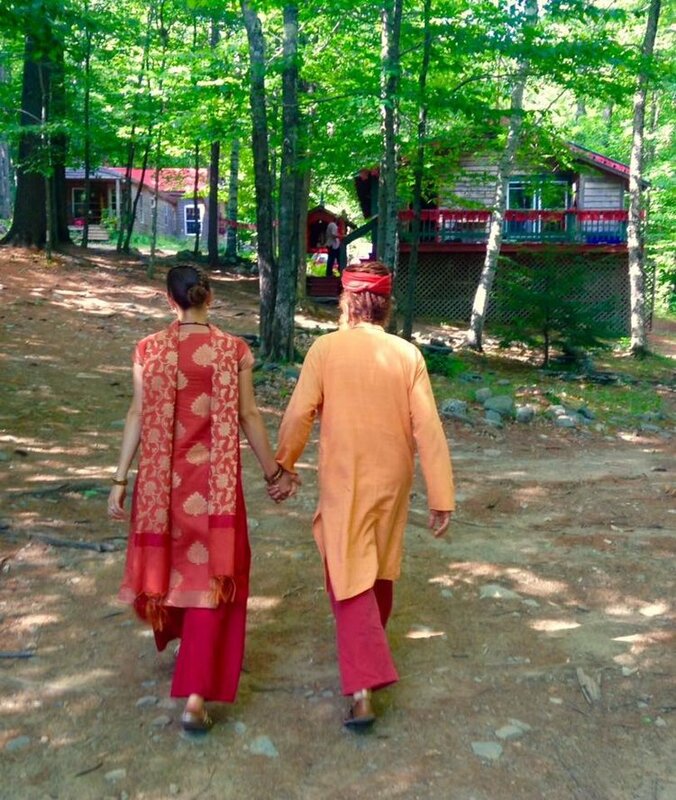 On a pilgrimage to Bar Harbor, Maine, in the summer of 1999, Sri Mirabai received private darshan with Sri Bhagavan for the first time. This darshan initiated the beginning of her enlightenment experience. 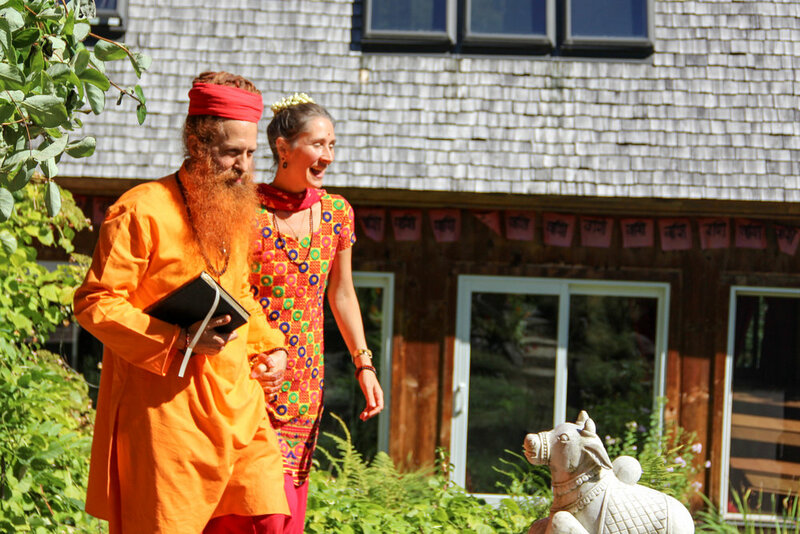 Soon afterwards, Sri Bhagavan and Mirabai traveled to India, where her enlightenment experience was solidified at Vashistha Gufa and at the Jogni Temple, the Temple of the 64 Yoginis, in Vashisht, India. At Jogni Temple, Sri Mirabai awakened to the true realization and experience of the Prana—the Life Force; the divine creative, or feminine, principle of Life. With this realization, Sri Mirabai became an embodiment of the Shakti, the Divine Mother. This gave her the ability to emanate the true power of the Mother: unconditional love and pure compassion for the benefit of all beings. On subsequent pilgrimages to India Sri Mirabai encountered and received the blessing from many Yogis, sage and deities, expanding her knowledge and experience. Sri Mirabai is Sri Bhagavan's primary disciple and counterpart. Together they guide the Yogis of Sat Manav Yoga Ashram and emanate Satchidanand through their teachings and their intense and accomplished sadhana (practice). For disciples of Sri Bhagavan and Sri Mirabai, aligning individually and collectively with their emanation—which literally is our own true nature and also yours—is the mission and purpose Sat Manav Yoga Ashram. This fundamental, living Truth is also the answer to all of humanity’s problems and the force that will transform this world. We invite you to explore our website to learn more about our Sat Manav Yoga practice and our way of life at the Ashram.